There is an ongoing scientific debate as to how much influence our changing climate had on the extreme cold snap or what some call “bomb cyclone” in the Northeastern US. As usual, there is an active discussion. Last week, World Weather Attribution claimed that the US has always epxerience cold snaps, but that “cold waves like this have decreased in intensity and frequency over the last century”. As the academics argue the specifics of the science of the relationship between extreme weather and climate, we know one thing: As New York shivered – Alaska sweltered. Alaska has just experienced its hottest December ever recorded. 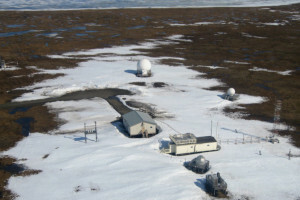 The temperatures in Alaska were 15.7°F above the 20th century average at 19.4 degrees, according to the National Oceanic and Atmospheric Administration. And the Canary is issuing warning signals all the time. Before Xmas, I blogged about how scientists were talking about the “Old Arctic” – the one we once knew – and the “New Arctic” the one being fundamentally transformed by climate change. The “Arctic shows no sign of returning to reliably frozen region of recent past decades”, starts the National Oceanic and Atmospheric Administration’s annual Arctic Annual Report Card reported in December. When scientists were pulling the data together, the data from Barrow, Alaska – the northernmost city in the United States – was missing. This is because the temperature in the city had been warming so fast the data was automatically flagged deleted by an algorithm which clocked it as wrong and removed it from the climate database. Since then the situation has not improved. The Arctic was so warm in December that Arctic sea ice set a new end-of-year record low, according to the U.S. National Snow and Ice Data Center. This month, the Alaskan Division for Public Health also warned that climate change, with increased melting of the ice and permafrost and with the concurrent impact on wildlife, fish and game species, has the potential to create severe physical and mental health problems for Alaskans. They even use the word, first coined by philosopher Glenn Albrecht “solastalgia,” which warns of distress from unwanted environmental changes close to a person’s home. We could all soon be experiencing Solastalgia. The Arctic is our climate canary. What happens in the Arctic will soon affect us all.